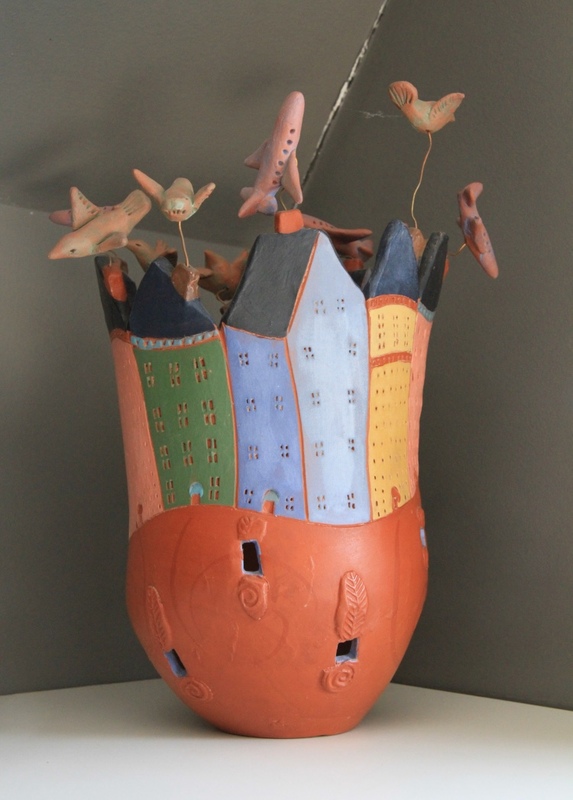 Walker mainly works making hand built pottery but also features glass beaded carpenter saws and sequin drawings. She holds a BA from Simon Fraser University (1989), and is a graduate of Emily Carr College of Art and Design (1986). 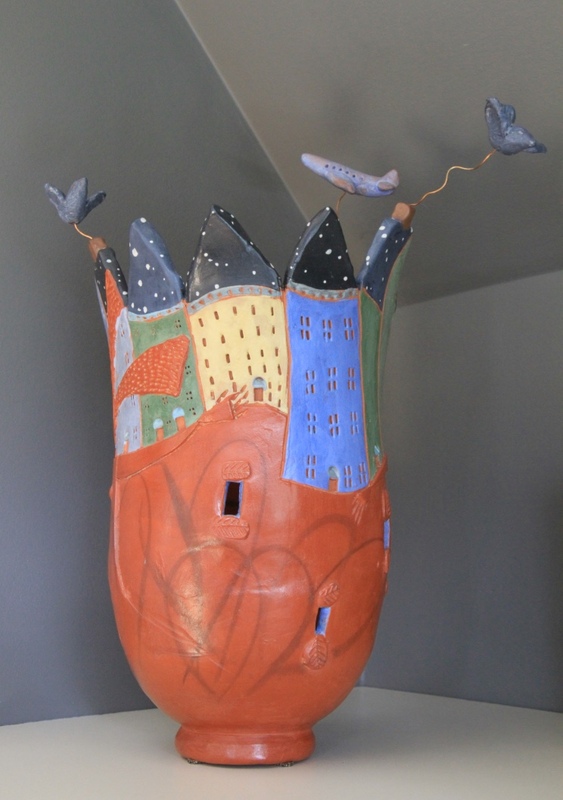 She has also studied metalsmithing and jewelry making at the Universities of New Mexico and Oregon, and fine art at the New England School of Art in Boston Massachusetts. I am fascinated with the act of hand building, the constructing of a work under the constant scrutiny of form, craftsmanship and imagination. The creating of one of my bowls begins after I have explored many ideas and drawn out a rough sketch of what I want to make. I use a red clay because I love its deep chocolate red colour. It also adds another colour which becomes especially importatant when I etch through the painted layers of colours on the exterior. Once the pot is bone-dry, I fire it to about 1,873 degrees farenheit. When it is still warm from the firing I remove it from the kiln and saturate it with a blend of hot bees wax and paraffin. The gives the pot its “finished” look as it seals the clay body. From here I polish the pot with flannel rags to bring to the surface to a soft satin buff. Lastly are the embellishments, usually these are gathered along the way during the making of the pot, by the time a piece is mostly finished I have a pretty good idea what “things” will be brought to the work to pull it together. 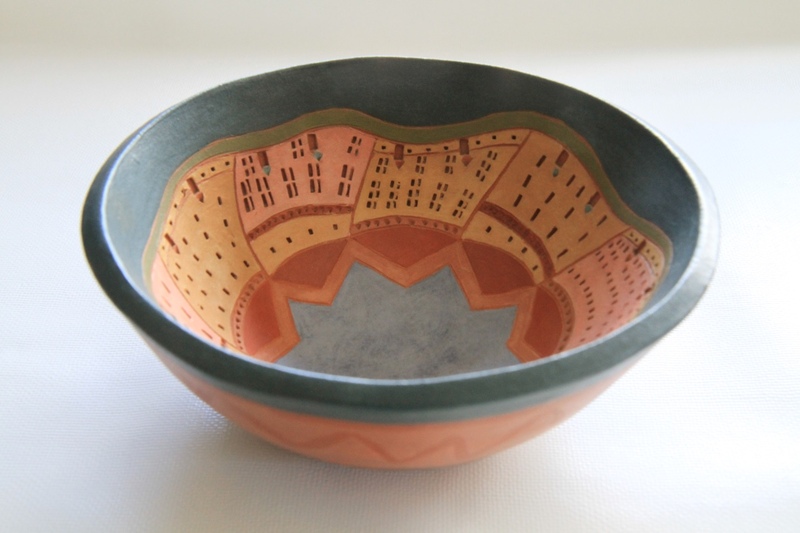 This is a series of hand built red clay wide and open bowls. 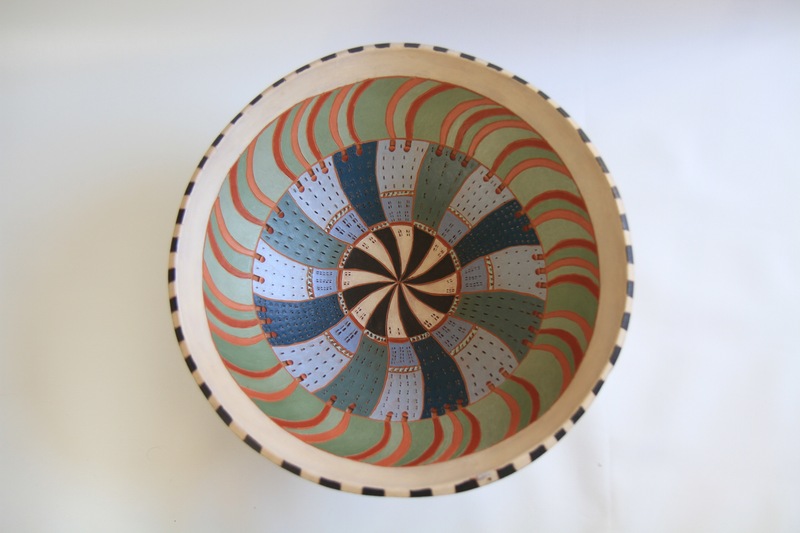 The detailed images are painted with pigmented terra sigillata clay slip. 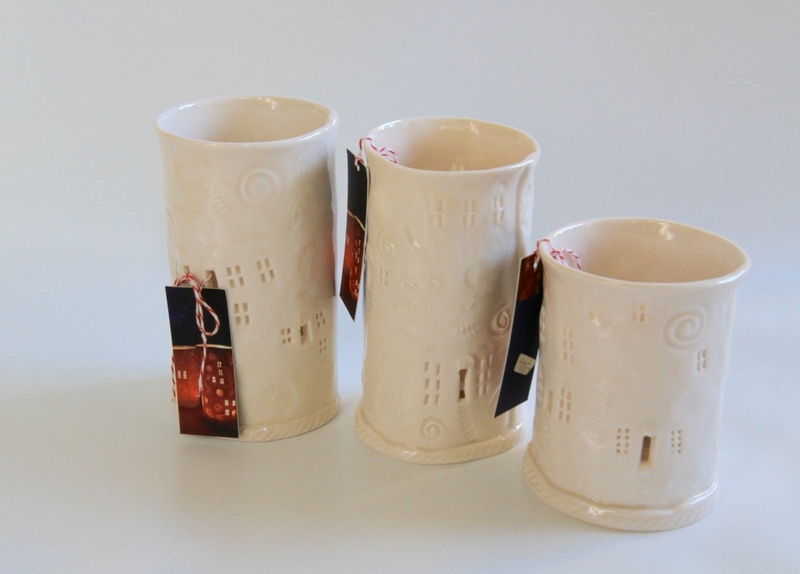 The inside images are highly detailed, the out sides are bold, wax-resist designs. The bowls are then fired to maturity at cone 04, saturated with a mix of waxes and then polished. Each bowl is a study of a number from one to seven. 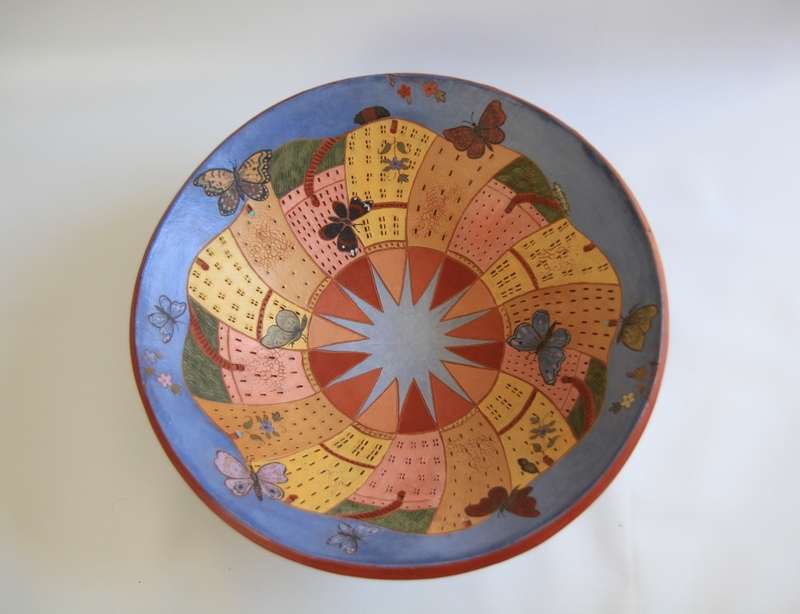 The fresco-like images are painted and imprinted on the inside of the bowls. In looking down into the bowl we are looking up into the sky. Perspective is turned upside-down. Looking up through the panoramic frames of country and/or city landscapes, sky shapes formed by the uneven circumference of the landscapes morph into stars or the mathematical images of nature. I am exploring. These panoramic circles explore the perpetual interrelationship of our intrinsic connection, and wonder of nature. They are of play and intricacies both obvious and obscure. They make sense.